one painted in a green camouflage design. 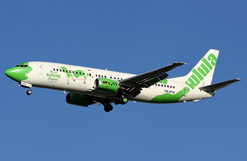 Low-cost airline kulula.com has taken its greenness one step further with the launch of its new tree-planting initiative. The airline, known for its humorous in-flight commentary and bright green livery, has embarked on Project Green, a programme that will see trees planted in communities around South Africa, and playgrounds and sports fields built in rural and township schools. With Project Green kulula.com (kulula is a Zulu word meaning “it is light” or “it is simple”) aims to challenge global warming and help ease the load on the environment by reducing its own carbon footprint. It will also take steps to offset its carbon emissions by planting grass and trees, which purify the air by taking in carbon dioxide (CO2) and converting it to oxygen during photosynthesis. Focusing only on trees that are not listed as invaders will also help to conserve indigenous ecosystems. Job creation is an added bonus, as horticulturalists will be required to supply young trees for planting. And tree-planting activities will offer more employment opportunities. Kulula.com has partnered with Food and Trees for Africa, a national greening organisation that also seeks to establish food security through permaculture food gardening activities. Permaculture is a holistic approach to using natural resources, working with nature as opposed to against it and making use of elements such as ecology, organic gardening, and architecture to create a sustainable way of living. The Food and Trees for Africa website offers companies a carbon calculator, which was developed by PriceWaterhouseCoopers, the first African company to receive accreditation to conduct carbon auditing. The calculator is based on the Global Greenhouse Reporting Protocols, which have now been converted into an environmental standard that deals with developing, managing and reporting greenhouse gas emissions at the company level. Companies can check their carbon emissions and from there take steps to reduce their carbon footprint. Based on the results, companies are informed of the number of trees it will take to offset their emissions. They may then make a donation so that Food and Trees for Africa can plant the necessary number of trees on their behalf through its National Tree Distribution and Trees for Homes programmes. Project Green got underway with the planting of 50 indigenous trees at the Monde primary school in Katlehong, east of Johannesburg, in April 2008. The trees were planted around a bare patch of land with the hope that in the not-too-distant future this will become a shady play area for Monde’s 1 400 scholars. Monde was one of three schools on the East Rand that received trees. In total, 100 trees at a cost of R70 per tree were donated. Gidon Novick, joint CEO (with Eric Venter) of Comair, which runs kulula.com, and the award-winning CEO of Food and Trees for Africa, Jeunesse Park, were in attendance at the ceremonies. Kulula.com is inviting its passengers and the public at large to support the campaign. Since December 2007 passengers booking with kulula.com have had the opportunity to contribute to the project by adding between R10 and R200 to their booking fee. To date the airline has raised over R172 000 through online donations. Kulula.com invites anyone who wishes to work with them on this initiative to contact them via the email address on the site. As part of its fight against global warming kulula.com has also upgraded its fleet. The last of the airline’s old McDonnell Douglas MD82 aircraft took to the skies on 29 February 2008. From the beginning of March passengers have been travelling in the more modern and fuel-efficient Boeing 737-400 craft, which cost R90-million each. Kulula.com spent R800-million on the upgrade but considers the investment well worth it as fuel costs have been cut by 15% and maintenance costs are lower too. These savings will be passed on to passengers. In addition to being more fuel efficient, the 737-400 aircraft are quieter and more environmentally friendly than the previous fleet. The noise reduction and low fuel consumption of the 737-400 are largely due to its superior engine. South Africa is the biggest culprit on the African continent with regard to greenhouse gas emissions, although compared to some Western countries its emissions are modest. The latest data available from the International Energy Agency reveals that in 2005 South Africa released 330.34 million tons of CO2 into the atmosphere. By contrast, in the same year the US was responsible for the emission of a whopping 5 816.96 million tons of CO2. The Department of Environmental Affairs and Tourism (DEAT) says the major culprits in South Africa are energy industries such as Eskom, the country’s national power supplier, general industry, and transport. However, the country is addressing these problems through, among other interventions, a national Climate Change Response Strategy document, which was compiled in 2004 as the government’s official response to the threat of climate change. The document addresses issues that have been identified as priorities for dealing with climate change in South Africa. Strategies for dealing with these issues include adapting to climate change; developing a sustainable energy programme; implementing an integrated response by various relevant government departments; keeping a record of greenhouse gases; accessing and managing financial resources; and research, education, and training. The South African government has also appointed a national committee on climate change which meets four times a year. Its primary function is to advise the minister of environmental affairs on matters relating to climate change and the way in which major national stakeholders can act against it. There is also a government committee on climate change which advises the DEAT sub-directorate dealing with climate change and ozone layer protection. Both committees work around the United Nations Framework Convention on Climate Change and the Kyoto Protocol – the chief instrument for tackling global climate change. These are the initiatives at national and government level, while organisations such as Food and Trees for Africa and kulula.com all contribute to the fight through their own programmes. Aircraft CO2 emissions continue to be a source of global concern. The European Union (EU) is fighting to impose quotas on airlines for CO2, proposing that these quotas be implemented from 2011. These restrictions will apply to both EU and foreign airline operators. It has also recommended that airlines operating in the EU should pay a fine should their carbon emissions rise above their current levels. In November 2007 EU legislators voted to strengthen a plan to cap carbon emissions from aircraft flying to and from Europe. The proposal centres on an existing carbon credit trading system that is already in existence, whereby industrial companies that exceed emission limits set by governments are required to purchase credits. The EU uses this system to control its emissions target under the Kyoto Protocol. The current system gives exemption to airlines but a proposal has now been submitted to include them. Needless to say the proposal has been shot down by the airline industry in general. But the European Parliament argues that including airlines in Europe’s carbon trading system would set an important precedent that could be emulated by other countries.